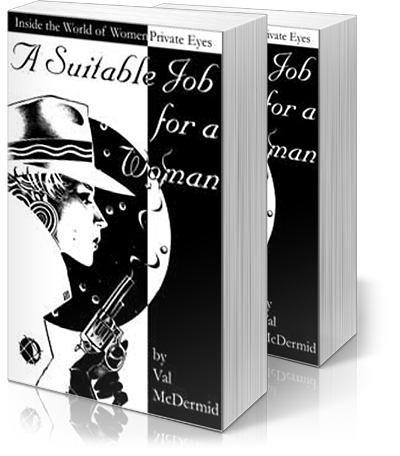 The female private eye is one of the sexiest and most exciting of fictional creations. But who are the real women who pound the mean streets? How do they get into this seemingly unladylike profession and what makes them stay, despite the risks they encounter? What qualities does it take to survive in this harshest of male worlds? From the elegant manager of a successful all-women investigation agency in Merseyside to the Californian woman who spends her days working for murderers, crime writer Val McDermid has spoken to female private eyes on both sides of the Atlantic, heard their most terrifying stories and learned how they work – whether it’s going undercover to bust drug barons or serving injunctions on violent offenders. What she discovered is a group of women who are every bit as tough and fascinating as their fictional counterparts, with lives that few could even imagine. A Suitable Job for a Woman is a riveting insight into the women who fight crime on their own terms and beat men at their own game. Val McDermid’s Kate Brannigan should remain firmly at the top of the private investigator’s league. Solid pleasure… so smooth you can almost kid yourself you haven’t been sitting on the edge of your seat throughout. This is crime-writing of the very highest order. McDermid’s galloping narrative converts information into pure protein.